In a market where memory foam mattresses rule the game, it’s hard to stay on top of the competition. 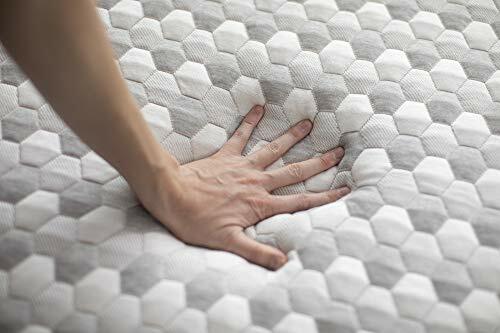 Thankfully, the mattress industry innovations have allowed brands all across the maps to customize their memory foam products, adding more and more features that create comfort and support, while also being able to add durability to the products. The Layla and the Purple mattresses are excellent examples of how research and development have progressed in the field. 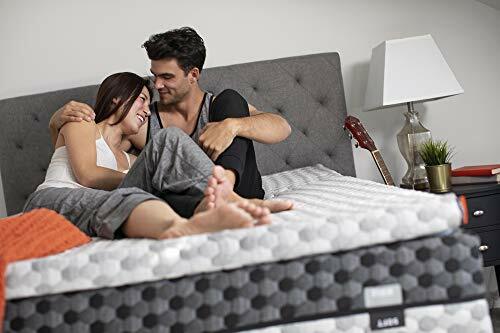 The Layla is a dual-sided mattress that’s looking to please both soft and firm mattress lovers up to a point where they don’t have to spend too much time deciding which kind of mattress to choose. The Purple bed, on the other hand, was developed to smartly identify where the sleeper’s body creates pressure points and work toward supporting them. Right from the very start, Layla promises comfort to its sleeper. The cover is made with a blend that combines polyester viscose and lycra. Right at the border between natural and synthetic lies viscose, combining smooth and soft feels that resembles the quality of cotton. The thermoGEL infusion in the cover aims at reducing some of that heat build-up that’s specific to memory foam mattresses. The pleasant cubic pattern is a feature unique to the Layla mattress, almost making customers feel sorry they have to cover it with sheets. The cover can be removed, but due to its construction, it requires dry cleaning. Since the Layla is a double-sided mattress, the construction layout depends on which of the two firmness choices you have facing upwards. The sequence we’re currently focusing on is valid when the softer side of the mattress is the one being used. The first layer underneath the cover is a three-inch-thick copper-infused memory foam block with a 3.5 lbs density. As you will come to see later on in this review, this layer is also replicated on the bottom side, but thinner. 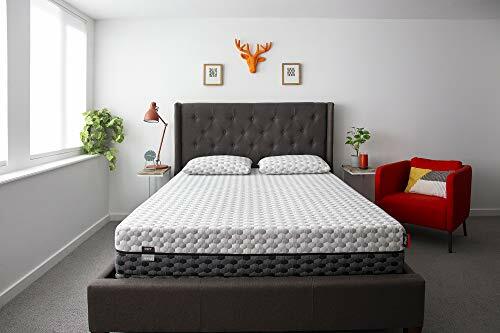 This block of memory foam provides plenty of support for people who like to sleep on the side and manages to balance the need to stay on top of the mattress, while also providing body contouring for added support. The copper-infusion is yet another cooling measure taken to reduce some of the heat retention discomforts. The transition layer of the Layla mattress is a two-inch block of poly foam, with a 1.8 lbs density. The layer has an egg-crate shape, leading us to the third cooling feature of the mattress. Because of its shape, the layer facilitates airflow, to make sure the sleeper won’t experience any heat-related discomfort. Having a generous base layer is important with every mattress, as it provides durability to the structure and gives the bed it’s shaped. With the Layla, you can expect a 4.5-inch layer of support foam, which gives the mattress firmness no matter which side you’re currently using. Of course, if you rest on the firmer side of the mattress, you will reach the support foam a lot faster, as there is a thin comfort layer that lies between your body and this base layer. When you flip over the mattress with the firmer side up, the bottom layer becomes the first one which, in this case, is a one-inch block of copper-infused memory foam. When located at the base of the mattress, this layer doesn’t really do much, but at the top, it provides just the amount of body contouring you would expect from a medium-firm mattress. 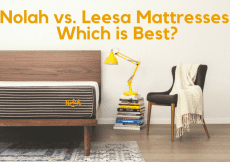 Even if people of several weights will feel the firmness or softness of the Layla mattress differently, there are some general conclusions one can draw while testing the dual-sided bed. Let’s examine how the softer side of the mattress feels. Lying on the back, you will feel how the memory foam absorbs your pressure and contours the heavier parts of your body. Because the upper layer of foam has a slower response to pressure, switching positions isn’t as smooth as it is with other mattresses. Side sleepers will feel how their shoulders and hips dig deeper into the surface. As you roll over on your stomach, the construction of the mattress works towards evenly distributing your body’s pressure across the entire surface of the bed. Your hips will sink in a little bit, which is expected from a softer mattress and could, in time, lead to lower back pains. Curious to know how the firmer side of the Layla performs? When you’re lying on your back, you will feel the memory foam layer contouring your body, but also immediately reach the support layer that provides way more support and pushed the foam to support your spine. The firm side does a good job in making you feel like you’re resting on top of the mattress. Rolling over to the side, the comfort layer pushes even fasters towards the support layer, making it more uncomfortable for side sleepers compared to the soft side of the Layla. 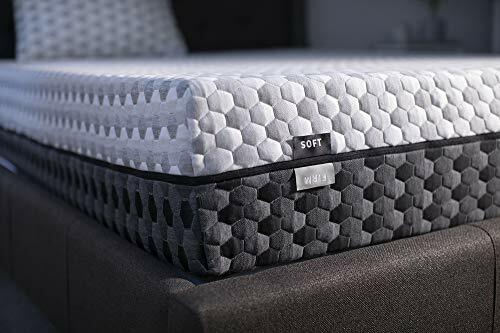 As you’re lying on your stomach, you will feel how the mattress pushed your hips upwards, definitely providing more support compared to its softer counterpart. There are a lot of reasons that motivate Layla’s choice for using copper-infusion in its comfort layers. The first reason is cooling. Aside from silver, copper is a metal known for its conductivity features, meaning that pressure applied on the copper cells will lead to compression that absorbs body heat. Second, copper is supportive, which guarantees a better pressure relieving system for side sleepers, that have their shoulders and hips deeply sunk within the mattress. Last, but not least, copper is known for having antimicrobial properties, which aids in preventing the appearance of mold, bacteria or fungi. Just by analyzing the blend that’s used to create the cover of the Purple mattress, one can tell the manufacturer was looking to combine the smoothness that customers are looking for in a mattress cover with the cooling technologies that have boosted sales on memory foam mattresses. Lycra was added to the combination because of its moisture-wicking properties, which are often taken advantage of in the sports apparel industry. This layer is what makes the Purple mattress one of a kind. The two-inch comfort layer of the mattress does more than just provide great pressure relief: it also adds a little bit of bounce to the mattress. 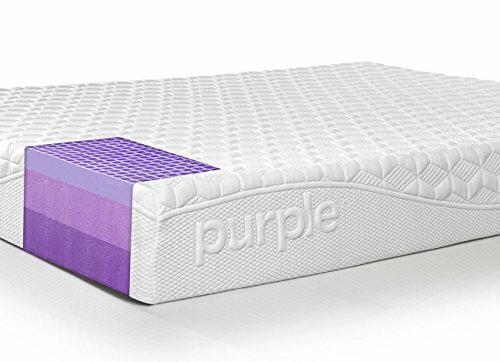 The grid structure of this layer has a very unique shape and properties that enhance the comfort and support given by the Purple mattress. The polymer columns have a threshold that, once exceeded, will activate a weight distribution feature, determining where your body needs the most support and focus on providing it. Also, due to the column construction, there is a sufficient amount of leftover space that ensures the air can circulate within the mattress and provide cooling for the sleeper. The second layer of the Purple mattress measures 3.5 inches in height and acts as a transition layer that supports and protects the polymer columns above and the base below. At the base of the mattress, we found a four-inch layer of poly foam with a generous 2 lbs density. This generous base layer gives the Purple mattress its shape while providing support for the two layers that lie above it. The firmness of a mattress is the ultimate deciding factor, as it gives the sleeper and idea on what to expect as far as pressure point relief is concerned. It’s always important to pick a mattress after having determined what are your individual sleeping habits and favorite positions because the construction of a bed will provide pressure point relief at a higher or a lower level. With the Purple mattress, you can expect a firmness level of about 6/6.5, which depends on your total weight. As you apply pressure on the top of the Purple mattress, you will feel the polymer columns in action. Their bounciness is what aids the sleeper in switching positions with ease. Lying down on the mattress, we felt the interaction between the comfort layer and our bodies, triggering the weight-distribution feature for added comfort. While there is so much to love about the construction and feel of the Purple mattress, the polymer columns are a bit tricky, in a sense that people who are extremely lightweight won’t really get a chance to benefit from the unique feature of this layer. There is a certain amount of pressure required for the support of this upper layer to trigger the weight distribution feature. So, how does the Purple mattress perform under different sleeping positions? As you’re lying on your back, you can feel that support is just where it needs to be. The polymer columns are quick to respond to pressure, while the bounciness of the mattress will make you feel like you’re on top of the “situation”. As you’re experimenting with sleeping on the side, you will notice that there is a little bit of pressure in the hip area. This, of course, depends on your total weight and how the polymer columns react to your given situation. However, the Purple mattress has every chance to be one of the best mattresses for side sleepers you’ve ever seen. As for stomach sleepers, we’ve got great news as well. People who prefer this sleeping position need a mattress that can push back their hips, preventing them from sinking into the mattress. The Purple does a good job at this chapter, making sure that the spine stays as aligned as possible (still not a recommended sleeping position, though). 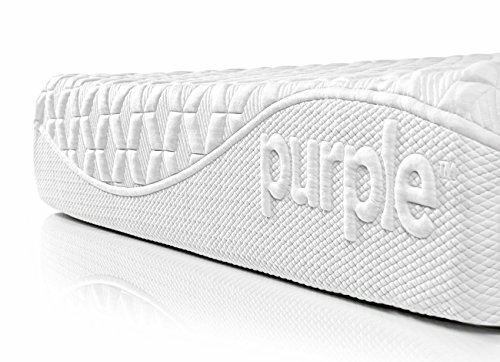 If you ever mention the Purple bed to a mattress expert, the first thing they’ll start talking about is the polymer grid. That’s because this is a layer that successfully manages to perform three simultaneous roles. First off, there’s the pressure point relief, as the layer is capable of recognizing where the body sinks in heavy into the surface and triggers support for that specific zone. The second role is cooling down the sleeper. The open grid design made from polymer columns provides a sufficient number of gaps that allow air to circulate, preventing heat retention on the top of the mattress. Third, there’s the bounciness. Because this layer can quickly respond to pressure, it minimizes motion transfer, making bed sharing a breeze. It’s always interesting to examine how edge support performs in different memory foam mattresses, which are known for their high levels of compression once pressure is applied on the surface of the material. Rolling over to the edge of the Purple mattress, you will get a decent amount of support, which is always good news. In fact, the level of edge support is pretty similar to the one you feel as you’re sleeping closer to the center of the mattress. Sitting on the edge of the Purple bed, you will feel a little bit of compression, but that’s to be expected when you apply so much body pressure on a narrower area of the mattress. Overall, the edge support of the Purple bed is above average considering this is a foam mattress, after all. 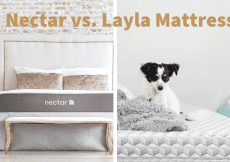 Fans of copper-infused memory foam are the first to fall in love with the Layla mattress. Being present on both sides of the mattress, the copper-infused layers do a good job in supporting the body, giving comfort to those in need, regardless of the firmness chosen. Because of its construction, the Layla mattress aims to please customers that face problems with sleeping too hot. The manufacturer has included copper-infusion, a convoluted layer and a thermoGEL infusion in the cover to help solve the overheating issues present in basic memory foam mattresses. There are a lot of things we can say for certain about the Purple mattress. First of all, it’s one of the best choices for side sleepers. Pressure tests have revealed how it manages to relief pressure points in key areas that might cause a disturbance in a firmer mattress. 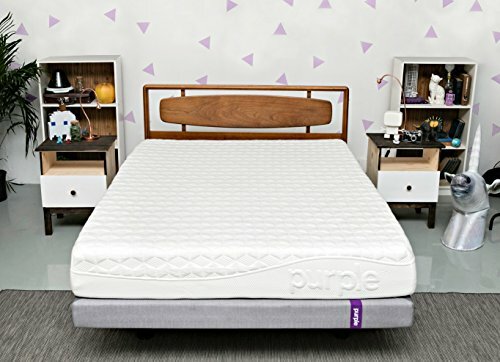 If you’re looking for a mattress that can also provide a little bit of bounce, the Purple is just the right product for you. The polymer columns have a quick response to pressure, making it easy to switch positions and get in and out of bed. 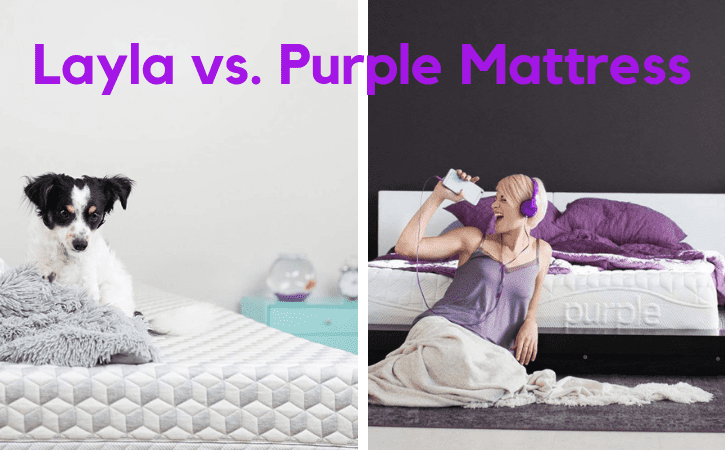 Both the Layla and the Purple mattress are quality beds for people who love the classic memory foam feel. Although they fall under the same category, they are very different from one another. The Layla mattress was designed for people who don’t want to have to choose a firmness option but would much rather benefit from a dual-sided product that can easily be flipped to match your current sleeping needs. The unique construction of the Purple mattress makes it an ideal sleeping companion for people who prefer multiple sleeping positions and want good support whatever the situation.